Since I had a session with you Jan 23 and have been listening at various times (before I go to sleep) of the CD you made, I am happy to say that I am feeling much better! On a rare occasion I felt the beginnings of anxiety stirring which my breathing has squelched! I think that before we met, I wasn't as aware of the inklings of anxiety symptoms, and by the time I felt it I already had an elephant sitting on my chest! Thank you so much for sharing your gift and training. I hope you continue on your journey of healing and continue to be stronger and stronger. May your health and happiness flourish and shine like the beautiful light inside of you which glows brightly, I know, I got to see! You may appreciate that I have heard myself tell my patients (while in pain) new versions of relaxation instructions, something like: 'breath in deeply, feel your lungs expands, now slow down, let go, relax'!" "On August 22, 2009, Anthony, his sister, my husband and I boarded a plane to Phoenix and then another plane to Maui. A couple of days before departing Anthony had asked his dad if we could give him a sleeping pill while traveling. I pulled out the CD you'd made for him and he continued listening again at night. I think he probably listened to t about 13 times at night as he fell asleep. He was happy and excited as we took off. On the way home, we took a red eye flight (10:30 p.m.) and he was so excited about getting back home, he slept about 45 minutes and then stayed awake until the sun came up. We watched Zathura on his PSP and when we landed from Maui to Phoenix, he said it felt like it took only about an hour". "At a luau in Maui we sat next to a couple who were from Long Island and they had left their 10-year-old son with his grandparents. The boy did not want to fly to Hawaii because the flight was too long and he got anxious thinking about staying on a plane for that long. I couldn't believe my ears and our good fortune to have overcome this issue with Anthony. Of course I shared with them our situation. Thank you for making our vacation work out so well and helping Anthony master this fear. He felt great confidence knowing that he had gotten over it." I want to thank you again for the hypnotic sessions on trying to improve my golf game. It really helped me believe and focus on my prize of becoming a great golfer. At first I was a bit skeptical when I heard how hypnotherapy could help my game, but in the end I was very satisfied with the sessions. Golf wasn't the only thing that hypnotherapy helped me with; it has also helped me become a more confident person in myself. I really enjoyed the sessions because they were relaxing, and gave me a great mental game. Thanks again for all your help with my golf game and my confidence level. It really works! "I visited Sue Berman for two things--to conquer my fear of public speaking--and to achieve better success at losing weight. I have always been extremely anxious when I have to speak in public. I would shake, barely breathe at all and forget when I had to say. After my sessions with Sue, I am now much calmer and feel more comfortable when I have to speak in public. As to my weight, I have struggled with weight loss all of my life. Since visiting Sue last year, I have lost nearly 40 pounds. In both cases, through Sue's techniques I was able to visualize success in both of these areas and maintain focus on what I wanted to accomplish. Sue's sessions are soothing, uplifting and relaxing and afterwards she gives you a CD that you can listen to at home or put on your iPod. I heartily recommend her hypnotherapy program. It works!" "I had taken a national board for my vocation and failed the first time. I was very anxious about taking it the second time. I also had difficulty studying for the exam. I went to Sue Berman for test anxiety and had just one session. On the day that I took the exam for the second time, I was calm and able to focus. I felt confident in my ability to pass the exam. I am happy to say that I passed the exam, and thank Sue for her hypnotherapy session!" "Our son was having a difficult time focusing in the classroom and while completing homework. Since his hypnotherapy session with Sue Berman, and continued use of the CD of the session at home, he has been able to self control his behaviors and increase his ability to focus. He is not as easily distracted as he was prior to implementing this technique. We have seen a difference in his ability to regulate his own behaviors and attention tasks. This has been a fabulous tool for our family and a great alternative to medication." "I just wanted to give you some feedback on Brandon. On Friday, May 8th I received a phone call from the same teacher Brandon's been having problems with and we talked for a long time. I told her we were working on his self-confidence, focusing, and concentration. Anyways not knowing she was going to call, I had already asked for a meeting with her and the principal because this was the only class he was having issues in. Brandon listened to the second CD all weekend and by Monday when he came home from school said that his teacher told him he was fantastic and gave him a high five. I was amazed and I told him how proud I was of him. We still had the meeting on Tuesday morning and I addressed how he felt that he was a bad kid and not liked by the teachers and that he needed to build up his self-confidence with positive reinforcement. I told them how happy he was on Monday. They agreed and with the help of the CD and the teachers he had a great week. Everyday I received a positive e-mail from his teachers. It was great! So thank you for all that you did!!!!!" "When I was diagnosed with IBS, I searched for relief for three years. I tried a variety of options looking for a solution. I had read about the results hypnosis had to offer IBS sufferers and wanted to try it. I talked to my doctor about the idea; she completely supported it and even connected me with a hypnosis center. They were not the right fit for me, thus sending me on a search for the right hypnotherapist for me. A chance meeting led me to Sue and immediately after talking to her I knew she was the right fit for me. Sue was very positive, patient, answered all my questions, and made me feel very comfortable with the hypnosis experience. As for the IBS symptoms -they have greatly improved. I love that Sue makes CD's of my personalized sessions, so I can listen to them each night as I fall asleep. The repetition of listening to the session helps reinforce the results and offers you a relaxing night's sleep. I am very thankful to Sue for her support and healing spirit. Thank you, Sue for being a huge part of my healing journey." "As you know, when one's sleep is disturbed it can really pay a toll on your body. I was becoming increasingly more exhausted, and although I had tried sleeping pills a few nights, this clearly was not the correct answer I was looking for. After my hypnotherapy session with you I was pleasantly surprised at not only how quickly I went to sleep, but that I remained asleep for the duration of the night! I was also very pleased with your professionalism and impressed with your vast knowledge and experience in the health care industry." "I've finally come to admit that I am afraid of heights and public speaking. Just to name a simple example, there has been more than one occasion when I was standing on the second floor balcony at the Westminster Mall. A deep sensation inside me prompts me to jump off, causing me to back away from the railings. I had no idea who to turn to help me with this situation. I also have fear in public speaking. I stutter, palm sweat, and multiple times become speechless because my mind jumbles up with words that can't come out of my mouth! My first hypnosis session with you was memorable. You made me feel very comfortable and assured me that I would not do funny things or things that are not within my control. After only one session with you, I continue to listen to the tape you provided. I can now say that I can stand at the railing of the mall without the fear of heights sensation. I have more confidence in speaking with people, even strangers. My words come out with more clarity. I have more "Thank-You's" that I can say in one letter. You've done wonders in my life and my ability to perform professionally as a physician." "Just wanted you to know that my daughter thinks I really got my money's worth from my session with you. Not only did I walk across the Golden Gate Bridge, I also went with my Daughter, Granddaughter and group to the Grand Canyon, stood by rails numerous times, plus walking across and peered over Hoover Dam. I also go to sleep very fast when listening to my tape. Your profession is a wonder to me." "I had smoked abut a pack of cigarettes a day for 35 years and tried to quit in the past, but had always returned to smoking. It was on December 4, 2002 that I came to you for hypnosis to stop smoking. I am proud to say that I have been a NON-SMOKER since then! Since I stopped smoking I really feel great. My sense of smell has improved and I now can tell someone that is a smoker from 10 to 15 feet away. I am sure happy that it is not me that smells like smoke! In addition to the health benefits of no longer smoking, I have also noticed that food tasted better. You are very professional in your services and I have recommended you to many of my friends and family." I really enjoyed our hypnotic sessions focused on improving my golf game. 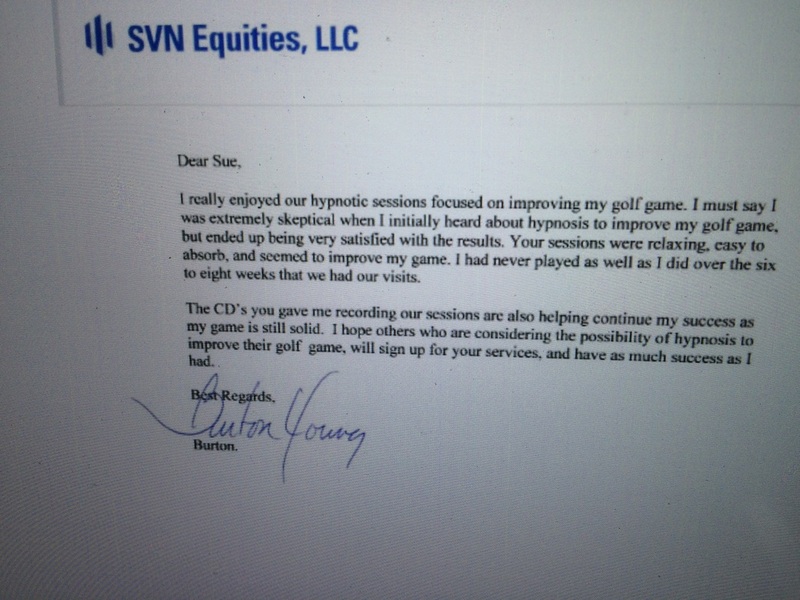 I must say I was extremely skeptical when I initially heard about hypnosis to improve my golf game, but ended up being very satisfied with the results. Your sessions were relaxing, easy to absorb, and seemed to improve my game. I had never played as well as I did over the six to eight weeks that we had our visits. The CD's yo gave me recording our sessions are also helping continue my success as my game is still solid. I hope others who are considering the possibility of hypnosis to improve their golf game, will sign up for your services, and have as much success as I had.